Feature mid-rise with shaped legs and half elastic waistband with drawstring closure. For storage - 3 pockets: 2 front slash pockets and 1 cargo pocket on right with pen slot. For added style and flexibility - ankle vents and a heat transfer logo on the cargo pocket. Approx. inseam for medium is 31.5". The Skechers SK201 Reliance Cargo Scrub Pants feature a mid-rise with shaped legs and a half elastic waistband with drawstring closure. For storage, there are 3 pockets: 2 front slash pockets and 1 cargo pocket on the right with a pen slot. 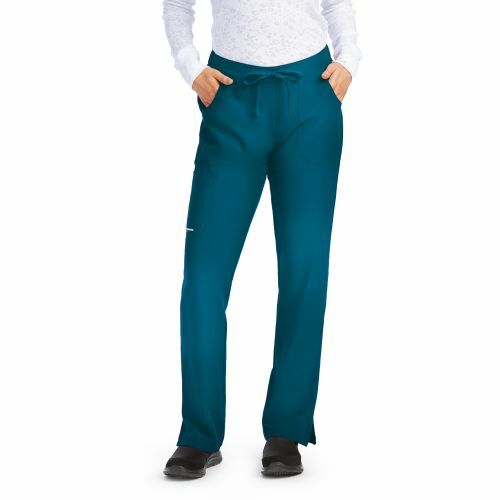 For added style and flexibility, these cargo scrub pants include ankle vents and a heat transfer logo on the cargo pocket.